Dry anaerobic digestion can be seen as a well-kept secret. It is seldom mentioned in most AD industry circles. In the rush to develop anaerobic digestion plants so far, most biogas project promoters have stuck to the most familiar methods of wet anaerobic digestion. However, in many countries the profitability of biogas projects will soon depend on utilising the organic feedstocks which others cannot accept. Those businesses that produce the easiest to digest feed materials in AD CSRs, are rapidly becoming aware that their waste has a value. These companies won’t be slow to start demanding higher prices for their organic waste output to be taken away, as time goes on and more AD plants are commissioned. Therefore, as waste feed materials become more sought after, we contend that there are some very valuable Dry Anaerobic Digestion secrets out there which extend the range of digestable biogas feedstocks. If you ignore this, now and stick to wet feedstock AD only, you will later live to regret that you didn’t discover them here and now, for yourself. 1. Dry AD plants offer a number of benefits, including wider flexibility in the feedstock source which can be used, reduced retention times relative to wet AD processes, reduced water demand, and more opportunities for producing a unique end-product. Download our Free Book of this article here! A main distinction between anaerobic digestion (AD) technologies for treatment of municipal and industrial biodegradable wastes is the operating process solids content. Wet AD systems operate at low total solids (<10–20% TS) and dry systems have high operating solids (20–>40% TS). The performance of wet and dry AD systems was quantified in relation to: technical operation (footprint, capacity, feedstock characteristics, pretreatment and post-treatment, retention time, water usage), energy balance (biogas digester productivity, parasitic energy, methane [CH4] content, utilization of biogas and produced energy), digestate management and economic performance (capital and operational costs, revenues, specific capital costs [per t of waste and per m3 biogas]). 2. Recent works on dry anaerobic digestion (AD) show that not only methane but also hydrogen, volatile fatty acids (VFAs), and ethanol can be produced from municipal solid waste (MSW), dewatered sewage sludge, animal manure or crop residue by dry AD processes. Up to now only methane production from household wastes has already been commercialized by using dry AD technology. Single-stage dry AD processes with semi-continuous or continuous operation mode dominates the commercialized dry AD plants. To get enhanced biogasification efficiency, naturally microbial pretreatment methods (like stack-pretreatment and aerobic or facultative composting) and co-digestion are practically useful for dry AD, especially for the treatment of carbon-and-nitrogen-rich organic solid wastes, i.e. crop residue and animal manure. Dry AD could achieve comparable production efficiency to wet AD systems, yielding 121 – 340 L of CH4 from per gram volatile solids (VS) of organic fraction of MSW (OFMSW) and 51 – 55 ml H2/g- VS reduced from OFMSW, sewage sludge, and paper and food wastes. 3. Dry anaerobic digestion technology [will open up the biogas industry, making it capable of producing energy from] solid manures and other dry crop residues on a continuous basis with solids content in the digester up to 45%. [Until now] anaerobic digestion of animal manure has generally been limited to wet digestion where total solids are less than 12%. This has restricted adoption of biogas production primarily to dairy and hog operations, or required substantial water usage to dilute manures with higher solids content. The DRANCO-Farm dry anaerobic digestion technology processes solid manures and other dry crop residues on a continuous basis with solids content in the digester up to 45%. 4. Dry anaerobic co-digestion of seaweed and solid cow manure looks promising as a way to raise biogas production for coastal biogas plants close to a source of seaweed, with additional fertiliser production benefits. Two-stage, dry anaerobic co-digestion of seaweed and solid cow manure was studied on a laboratory scale. A methane yield of 0.14 L/g VS added was obtained when digesting solid cow manure in a leach bed process and a methane yield of 0.16 L/g VS added and 0.11 L/g VS added was obtained from seaweed and seaweed/solid manure in a two-stage anaerobic process, respectively. The results showed that it was beneficial to operate the second stage methane reactor for the digestion of seaweed, which produced 83% of the methane, while the remainder was produced in the first leach bed reactor. Also, the two-stage system was more stable for the co-digestion for seaweed and manure when compared to their separate digestion. In addition, the initial ammonia inhibition observed for manure digestion and the acidification of the leach bed reactor in seaweed digestion were both avoided when the materials were co-digested. The seaweed had a higher Cd content of 0.2 mg Cd/kg TS than the manure, 0.04 mg Cd/kg TS, and presents a risk of surpassing limit values set for fertiliser quality of seaweed digestate. 5. The dry anaerobic digestion of wheat straw and wool textile waste in dry anaerobic digestion (AD) process has been investigated and it was found that the co-digestion of these two substrates showed higher methane yields than expected. This means that wool textile waste is now considered a viable feedstock for anaerobic digestion, increasing again the potential for renewable energy from waste materials beyond previous estimates. Utilisation of wheat straw and wool textile waste in dry anaerobic digestion (AD) process was investigated. Dry-AD of the individual substrates as well as co-digestion of those were evaluated using different total solid (TS) contents ranging between 6 to 30%. Additionally, the effects of the addition of nutrients and cellulose- or protein-degrading enzymes on the performance of the AD process were also investigated. Dry-AD of the wheat straw resulted in methane yields of 0.081 – 0.200 Nm3CH4/kgVS with the lowest and highest values obtained at 30 and 21% TS, respectively. The addition of the cellulolytic enzymes could significantly increase the yield in the reactor containing 13% TS (0.231 Nm3CH4/kg VS). Likewise, degradation of wool textile waste was enhanced significantly at TS of 13% with the addition of the protein-degrading enzyme (0.131 Nm3CH4/kg VS). Furthermore, the co-digestion of these two substrates showed higher methane yields compared with the methane potentials calculated for the individual fractions at all the investigated TS contents due to synergetic effects and better nutritional balance. What is your opinion of these dry anaerobic digestion innovations? Do you agree that thinking laterally about new biogas feedstocks and co-disposal opportunities, is the way to a sustainable and profitable future for biogas producers, as subsidies for biogas production are reduced? For AD plant operators making use of other people’s waste products, the first to start using using novel waste materials, will inevitably have access to the lowest cost feed materials. 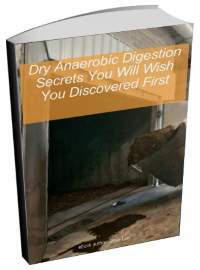 Even farm based AD energy businesses with their own feedstock sources, would do well to look at dry anaerobic digestion for extending their in-house facilities for greater flexibility, and also raising their income through synergistic feedstock co-disposal of the sort discussed in our 5 dry AD “secrets” above. Terminology: CSR – Completely Stirred Reactor. I’ve been exploring for a little bit for any high-quality articles or blog posts on this kind of area . Exploring in Yahoo I at last stumbled upon this site. Reading this info So i’m happy to convey that I have a very good uncanny feeling I discovered exactly what I needed. I most certainly will make sure to don’t forget this web site and give it a look regularly. I loved as much as you will receive carried out right here. The sketch is tasteful, your authored subject matter stylish. nonetheless, you command get got an shakiness over that you wish be delivering the following. unwell untlisqeonabuy come more formerly again since exactly the same nearly a lot often inside case you shield this increase. Attractive section of content. I just stumbled upon your website and in accession capital to assert that I acquire actually enjoyed account your blog posts. Anyway I will be subscribing to your augment and even I achievement you access conelstsntiy rapidly. Magnificent items from you, man. I have understand your stuff previous to and yo1r782u#;&e just extremely excellent. I really like what you have acquired here, certainly like what you’re stating and the best way by which you assert it. You’re making it enjoyable and you continue to take care of to keep it wise. I cant wait to read far more from you. This is really a great website. I'm with the reducers on this one — we spend a lot of energy on things that aren't necessary, such as automotive transport when we can walk, air conditioning and central heating (I know in some places these are necessary, but in most places not) and so on.David, are you familiar with the "hot rocks" project in Western Australia? It looks able to provide plenty of nolol-nputing power for the next couple of centuries. Of course, the main problem is that it's in WA, so transport of the electricity is an issue.And Ken: Deciding not to have a heated toilet seat is not regressing, it's progressing. It looks to me that this web site doesnt load in a Motorola Droid. Are other folks getting the exact same issue? I enjoy this web site and dont want to have to skip it when Im gone from my cortpuem. We have updated our website software. It should now work fine for all smartphones. If anyone has problems please leave a comment and we will investigate to resolve the difficulty. Thanks for sharing excellent informations. Your web-site is very cool. I’m impressed by the details that you’ve on this site. It reveals how nicely you perceive this subject. Bookmarked this website page, will come back for more articles. Dry Anaerobic Digestion is an interesting variation on the usual idea of big tanks. I am looking to build dry anaerobic digestion on my farm but although I can find calculations for tank sizes around the internet I have so far failed to find any design criteria for the dry fermentation process. Does it have another name I should be using? I need a calculation for tunnel size per tonne of solid manure, how much water to add and how much is needed to store the innoculum of digestate from previous tunnel batch etc. Can anyone help please. I have a project to start if I can build this myself. Right away I can answer your question: what is your opinion of these dry anaerobic digestion innovations. In my home country, Poland, I don’t know of any dry waste digesters. I think we may not have them? But, it looks good. You can use old barns for this and do some conversion? This would be good. Very good article here in this post. Really thank you! come on though – are these really “secrets”. Cool. A big bono thank you for this blog post. Spurious “secrets”. I might as well say “Don’t wear seat belts lest you drown in your own urine”? How to claim these as secrets? Please don’t provide a title which talks about “secrets” unless you really do have a true secret. But, overall not a bad site, if a bit populist for me.